Millions of people in the U.S. suffer tooth loss due to so many reasons, ranging from injury to gingivitis or gum disease and tooth decay. Previously, the only way to cure them were dentures and bridges. But thanks to the recent improvements in dental care, dental implants are available today. In fact, dental implant is the most preferred way of tooth replacement these days. It not only replaces your missing tooth roots but also form a strong foundation for your replacement teeth and helps preserve the remaining bone of your mouth by providing the stimulation similar to your natural tooth roots. Better yet, this foundation feels, functions and looks exactly like your natural teeth. Dental implants are tiny titanium posts surgically positioned in order to mount replacement teeth and/or act as a bridge into that area. It is placed into the jawbone just beneath your gum. Unlike a denture, a dental implant doesn’t come loose and it also more beneficial to your general oral health as it you don’t need to anchor an implant to other teeth. 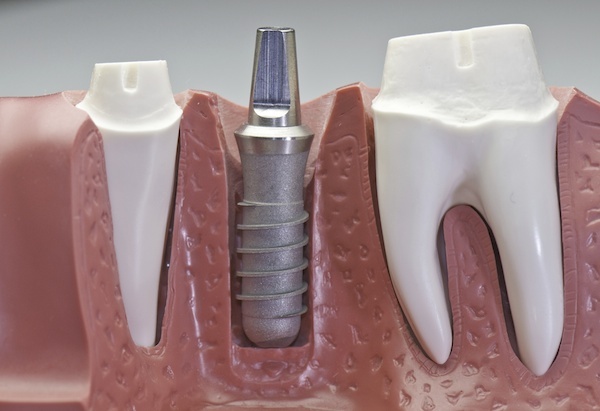 Root Form Implant: A screw type of implant, also known as an endosteal implant, that looks and feels like a tooth root. It is used if your jawbone has enough width and depth. However, it is not the best choice for jawbone deterioration such as too narrow or short jawbone. Plate Form Implant: If you have a too narrow or short jawbone, plate form implant is the ideal option. This involves placing a flat, long implant directly on top your jawbone, under the gums. It becomes more secure as bone and tissue grow around the implant. Subperiosteal Implants: If you don’t have enough bone width or height, making it almost impossible for performing root or plate form implants, a subperiosteal implant is the right choice. It involves a custom-made implant that acts as an artificial jawbone. The implant is attached to your natural jawbone, under your gums in order to enhance its surface area. Among these three types of dental implants, a root form implant is the most common one. These form of dental implants are used to support individual teeth as well as to anchor removable dentures. Typically, a dental implant treatment involves various pieces. But of course, you can often describe them in two main parts. First, restoration of the replacement teeth with an implant that matches the shape of your natural tooth crown; and second, is the implant itself, replacing the function of your natural tooth root. When asked Dr. David R. Scharf, a well-known periodontics in Long-Island area, about how Babylon dental implants work, he said that the first thing you need to consider is what the implant is made of. At present, implants are either made of titanium alloy or zirconium oxide although other materials have been tried and tested previously. But it has been observed that these two materials integrate better with bone, making the implant successful. Dr. Scharf further explained that titanium implants are usually a better choice as our body accepts titanium normally without infection. This alone explains why more than 95 percent of the dental implants made today use titanium alloys. In fact, since periodontics and implant companies started using titanium alloys, there has not been a single report of reaction nor allergy to the metal itself. That said, people with sensitivity or allergy to other metals should speak to their periodontics before opting for a dental implant. Zirconium oxide is a better option for those who are concerned about having any metals within the body. Also known as the “metal-free option,” zirconium oxide provides a very strong and hard support for crowns and bridges. However, titanium implants are considered as much more versatile compared to zirconium oxide as the former can be made as both one piece and two-piece systems. And two-piece systems offer more options prosthetically and are preferred by both periodontics and patients. The damaged tooth is removed. The jawbone is prepared for the implant often through bone grafting. The dental implant is surgically placed into the jawbone, beneath the empty tooth socket. As your jawbone heals, the dental implant osseointegrate, i.e. bonds with your natural jawbone, forming a long-lasting and strong foundation for your replacement teeth. Depending on your oral health and habits, it may take a few weeks to months for your jawbone to heal. Your oral surgeon will place a small connector on top of the implant once it bonds with your jawbone. This connector, called an abutment, helps the implant connect with the replacement tooth/teeth. Finally, the oral surgeon attaches prosthetic tooth/teeth, which may include a single crown or dentures with multiple teeth, to the abutment. The prosthetic tooth/teeth looks, feels, and functions similar to your natural teeth. The entire process is typically done under local or general anesthesia or sedation to control pain. And it may take a couple of months from start to finish. Typically, it may take three to nine months to complete the dental implant process; however, sometimes it may take even longer as you will need time to heal. Besides, the new bone in your jaw will take some time to grow as well. While it is normal to have minor discomfort, swelling or bleeding, contact your oral surgeon immediately if things get worse. Often, antibiotics and pain medications are required to help the jawbone heal. In addition, be careful about your diet; eat soft foods for at least 10-14 days to let the surgical site heal. Dental implants usually have a high success rate. And with proper dental care, it can actually last a lifetime. Besides, they are safe for virtually every patient, irrespective of their oral health or age. However, make sure the dental implant is performed by well-trained and skillful dentists.